Turquoise, believed to be the most valuable, non-transparent mineral in the jewelry business. Varies in color from sky-blue to blue-green to apple-green. Mostly turquoise is interspersed with brown, dark grey, or black veins of other minerals or the host rock. 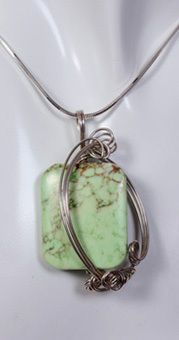 This turquoise stone has been cut into a rectangular shaped bead and measures 29 mm x 24 mm. Wrapped in argentium wire. Finished size is 51 mm x 31 mm. Weight 0.6 oz. Turquoise, called the stone of life and good fortune.